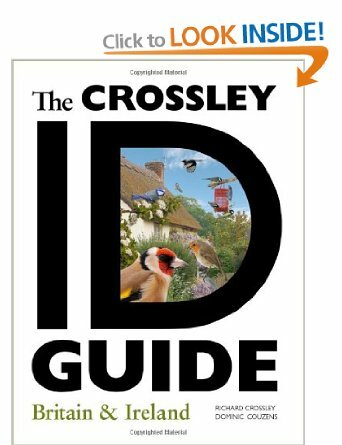 With a trip planned to northern Scotland during 2014, I was looking forward to The Crossley ID Guide – Britain and Ireland, by Richard Crossley and Dominic Couzens. I wasn’t disappointed. As in his other guides, the picture of common garden birds inserted in the letter ‘D’ sets the tone as a book that is aimed at beginning and intermediate birders, “yet equally by anyone who simply likes to look at birds or enjoys the beauty of the British and Irish countrysides.” The book is organized, not taxonomically, but by classifications of birds: Waterbirds (swimming, flying and walking), followed by Landbirds (upland gamebirds, raptors, miscellaneous larger and aerial landbirds, and songbirds). Another critical tool is the key in the back of the book describing how the material located with the plates is organized, including a glossary of abbreviations. One piece of information, not normally included in field guides is the prevalence of each species. For instance, knowing that there are between 200 – 250 pairs of Osprey lets the reader know that though it is a localized breeder, primarily in northern Scotland, it might be difficult to see. In contrast, 46,000 pairs of Common Kestrel can be found year-round throughout Britain and Ireland. This is a falcon you might likely spot. The Meadow Pipit, a species I have not seen on previous trips, should be fairly common at the time of my visit. 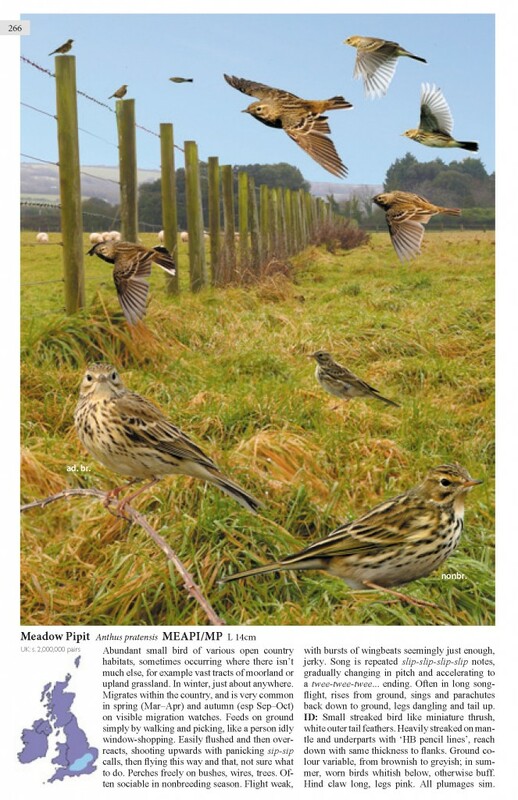 The plate has two close-up photos (adult breeding and nonbreeding) to illustrate the differences in its facial pattern and how it blends in with its habitat, the upland grassland and moors. There are photos of it flying, both fairly close and in the distance. There are two smaller birds perched atop fence posts – more typical of the nonbreeding season. While the book is written for a British audience, not the traveler, plates of birds in their natural habitat are useful for both audiences. My biggest disappointment is that it does not include the North American name for a species. This would not only assist the traveler, but aid in communication between birders. For instance, when my cousin refers to a Slavonian Grebe, I would know that she is talking about a Horned Grebe! I would heartily recommend this book both to the audience for which it was written, but also to the North American birder traveling to Britain or Ireland.